NASA scientists have interrupted the checkout and calibration of the Hubble Space Telescope to aim the recently refurbished observatory at a new expanding spot on the giant planet Jupiter. The spot, caused by the impact of a comet or an asteroid, is changing day to day in the planet's cloud tops. The Hubble picture, taken on July 23, is the sharpest visible-light picture taken of the impact feature. The observations were made with Hubble's new camera, the Wide Field Camera 3 (WFC3). WFC3 is not yet fully calibrated, and while it is possible to obtain celestial images, the camera's full power cannot yet be realized for most observations. The WFC3 can still return meaningful science images that will complement the Jupiter pictures being taken with ground-based telescopes. NASA scientists have interrupted the checkout and calibration of the Hubble Space Telescope to aim the recently refurbished observatory at a new expanding spot on the giant planet Jupiter. The spot, caused by the impact of a comet or an asteroid, is changing day to day in the planet's cloud tops. For the past several days the world's largest telescopes have been trained on Jupiter. Not to miss the potentially new science in the unfolding drama 360 million miles away, Space Telescope Science Institute director Matt Mountain allocated discretionary time to a team of astronomers led by Heidi Hammel of the Space Science Institute in Boulder, Colo. The Hubble picture, taken on July 23, is the sharpest visible-light picture taken of the impact feature. The observations were made with Hubble's new camera, the Wide Field Camera 3 (WFC3). 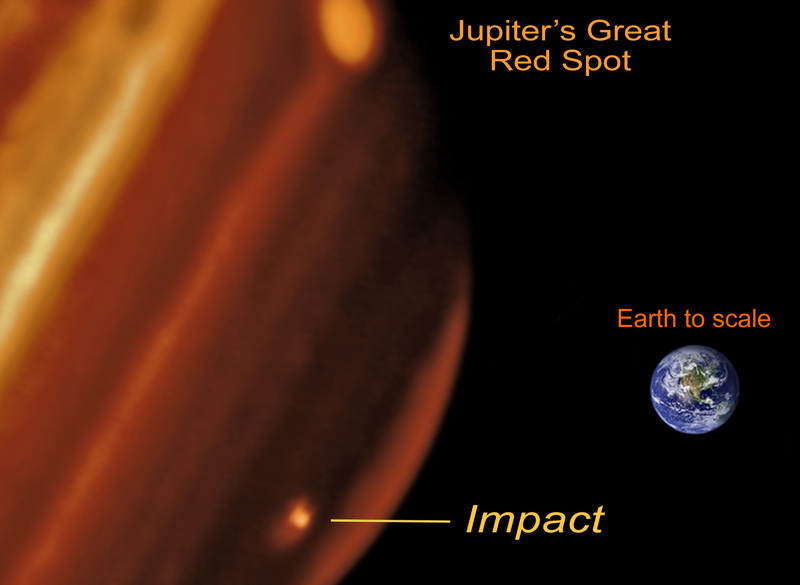 "This image of the impact on Jupiter is fantastic," said U.S. Senator Barbara A. Mikulski, D-Md., chairwoman of the Commerce, Justice and Science Appropriations Subcommittee. "It tells us that our astronauts and ground crew at the Goddard Space Flight Center successfully repaired the Hubble telescope." "This is just one example of what Hubble's new, state-of-the-art camera can do, thanks to the STS-125 astronauts and the entire Hubble team," said Ed Weiler, associate administrator of NASA's Science Mission Directorate. "However, the best is yet to come!" "Hubble's truly exquisite imaging capability has revealed an astonishing wealth of detail in the 2009 impact site," said Hammel. "By combining these images with our ground-based data at other wavelengths, our Hubble data will allow a comprehensive understanding of exactly what is happening to the impact debris. My sincerest congratulations and thanks to the team who created Wide Field Camera 3 and to the astronauts who installed it!" Co-investigator Imke de Pater of the University of California at Berkeley said: "The combination of the Hubble data with mid-infrared images from the Gemini telescope will give us an insight into changes of the vertical structure of the atmosphere due to the impact." Discovered by Australian amateur astronomer Anthony Wesley on Sunday, July 19, the spot was created when a small object plunged into Jupiter's atmosphere and disintegrated. The only other time in history such a feature has been seen on Jupiter was 15 years ago. "This is strikingly similar to the comet Shoemaker Levy 9 that impacted Jupiter in July 1994," said team member Keith Noll of the Space Telescope Science Institute in Baltimore, Md. "Since we believe this magnitude of impact is rare, we are very fortunate to see it with Hubble," added Amy Simon-Miller of NASA's Goddard Space Flight Center in Greenbelt, Md. She explained that the details seen in the Hubble view shows a lumpiness to the debris plume caused by turbulence in Jupiter's atmosphere. The spot is presently twice the length of the United States. Simon-Miller estimated that the diameter of the object that slammed into Jupiter was at least the size of several football fields. The force of the explosion on Jupiter was thousands of times more powerful than the suspected comet or asteroid that exploded over the Tunguska River Valley in Siberia in June 1908. The WFC3, installed by the STS-125 astronauts in May, is not yet fully calibrated. So while it is possible to obtain celestial images, the camera's full power cannot yet be realized for most observations. The WFC3 can still return meaningful science images that will complement the Jupiter pictures being taken with ground-based telescopes. This is a natural color image of Jupiter as seen in visible light.